Nobels ODR-1, Mooer Modverb, Rumble Drive, Shimverb, Rage Machine, Pitchbox, ReEcho, Trelicopter, Triangle Buff, Ninety Orange, Blade, E-lady, Blue Faze, Green Mile, Echolizer, Acoustikar, Cruncher, Ensemble King, Ana Echo, Hustle Drive, and Yellow Comp. Steve's been busy lately working on a solo instrumental project, and for 2018, while nothing has been firmed up yet, The Prunes have been asked to play the Nuggets Night in Portland, The Woodstock Festival in Istanbul Turkey, gigs in Mexico and there are always offers for UK & EU tours. Steve has also cobbled together some bits and pieces that just might develop into a new Prunes album - it could happen! Click here to learn more about Steve and the Electric Prunes. At the moment, I'm working on my own instrumental project with no rules or preconceived ideas. Doing sessions and playing in various musical environments has made me a musical jack of all trades, so I wanted to do something that demonstrates the different styles I've developed. A lot of times I will start with a riff or theme and see where it takes me spontaneously. 2) What is your musical background and influences? I started on violin as a kid in elementary school but didn't take to it and my parents were too poor to buy me one, so I had to stay after school to practice which didn't work out so well since I didn't want to hang at school any longer than I had to. I really wanted to play cello, but the school only had 3/4 and full size ones, which were too big for me. I was shipped off to boarding school in Germany soon thereafter and started playing piano until I found a beat up acoustic guitar with only 4 strings in a closet which I tuned like a cello until I could get a set of guitar strings and a friend showed me how to tune it properly. The first song I learned was "As Tears Go By" by the Rolling Stones.., The Move, the Beatles and the Stones were early influences, but as far as lead playing, I got into early Peter Frampton when he was in the Herd and then Humble Pie. One day after school, I bought a Patto album with Ollie Halsall on guitar and I thought wow, did they speed up the track? I tried to learn his stuff, even though I was still mostly playing rhythm guitar in bands and some keyboards and here there as well. Then came King Crimson, Deep Purple in Rock, Yes and ELP and the music was way above the abilities of the bands I was in then, and having had some classical training, I began drifting in that direction and wound up in a band where we would do Bach inventions and other short classical pieces in a rock vein in between cover songs from progressive bands. After the keyboard player left, I started doing the keyboard parts on guitar because I didn't want to carry a keyboard to the gigs, so I tried to emulate synths and organs with pedals, which started me down the rabbit hole of acquiring close to a 1,000 pedals over the years. 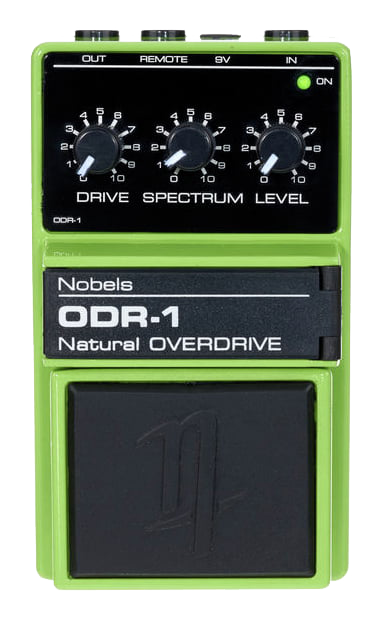 5) Why do you play Nobels ODR-1? / How many pedals are on your board?! I find the ODR1 to be the closet thing to a tube amp in a tiny package that fits inside a gig bag and can run on a 9 volt battery. It's also a great front end into an otherwise bland sounding amplifier and I've used it direct into a board or audio interface for recording sessions in home studios where cranking up an amp is not practical at midnight, or I'm too lazy to mic an amp. My main touring board (which is in front of me) has between 50 and 56 pedals on it, and sometimes I also have a small board behind me with 12 pedals on it, for when I have to turn around to cue the drummer, so I can still change sounds. I also put together a smaller touring board with 20 pedals, mostly Mooer micro pedals, originally for one off gigs or short tours where bringing the big stuff isn't practical. That now lives in Hungary for any European gigs and I also have several "mini" boards with 8 to 12 pedals that fit in a gig bag for impromptu jams and open mic's, both in CA and in Hungary.